While watching The Silver Zephyr, a show about the adventures of the world's greatest thief, Wario gets jealous and beams himself inside the show using the "Telmet". Stealing the Silver Zephyr's magic wand, Goodstyle, now Wario must prove he is indeed the greatest thief of all. Wario and the now-powerless Count Cannoli (Silver Zephyr's alter-ego) race to claim the greatest prize of all: the Wishstone. Wario can learn and assume seven different disguises, each with their own special abilities. Draw on Wario to transform him and use the new abilities to open up secret paths, defeat enemies and steal all the treasure. 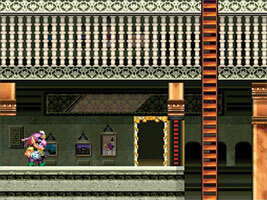 At various stages in the game, different objects will appear in Wario's house depending on the title he has. After acquiring the first title "Dabbler of Disguise", the object that appears is a figurine designed to look like a Super Mario Bros. era Wario sprite. Genius Wario uses an extendable arm with a boxing glove on it. This is based on Nintendo's classic toy, the Ultra Hand. Wario used a similar device in Mario Power Tennis. "An amazing handheld game unit with FIFTY screens! When unfolded, it takes up as much space as a timeshare condo." On the screen, you can make out that the game is Octopus.